Tucson stands with Palestinian prisoners on hunger strike | Fight Back! 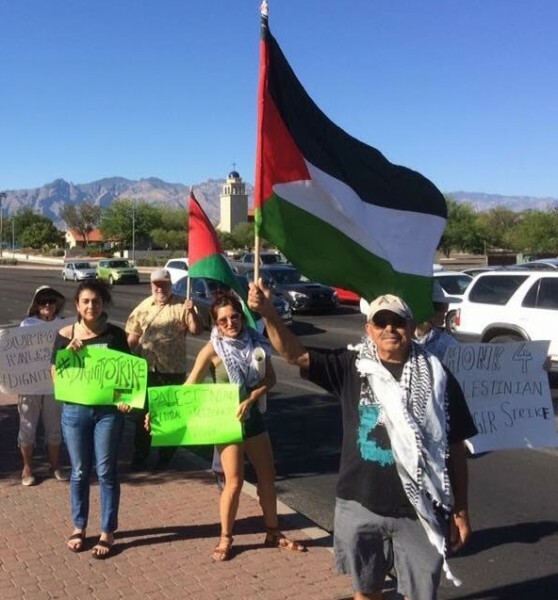 Tucson, AZ - Nearly a dozen people took to the crosswalks of a busy intersection here, May 13, to create more visibility for the close to 2000 Palestinian prisoners on hunger strike. Receiving many more honks in support than Zionist jeers, the group flew Palestinian flags and held signs reading, “Support the Palestinian hunger strike.” Passersby also saw the popular hashtag #DignityStrike, which is being used to spread information on the hunger strike via social media. The Palestinian prisoners are in their fourth week of a hunger strike to demand that their Israeli jailers provide better medical treatment, lift the heavy restrictions on family visits and communication, and other demands. Prominent Palestinian resistance leaders like Leila Khaled, of the Popular Front for the Liberation of Palestine, have joined the hunger strikes as well. The Tucson action joined 30 other events worldwide supporting the prisoners.